Ann Marie Thomas, Author: What's in a Name? How did Swansea and Gower get their names? The area has been settled for over four thousand years. Important prehistoric remains have been found in Gower dating to 2000BC. When the Romans invaded Britain, they built a fort at the mouth of the River Loughor, which is the western boundary of Gower. The fort was called Leucarum, and the Welsh call it Llwchwr. After the Romans, the Vikings came. Sweyne Forkbeard was a 10th century Viking King who ruled Denmark from 986-1014AD. The River Tawe, the eastern border of Gower, provided a natural harbour, and a settlement was created, named after him - Sweynesse. This was the first recorded name, in 1165, but it had obviously been in use since Sweyne's time. Spelling didn't begin to be standardised until dictionaries were introduced in the 17th century. Scribes would spell things according to their own fancy. So Sweynesse was spelled Sueinesea in 1190, and Swanesey in 1322. Today it's called Swansea. The city's logo is a swan, but the name has nothing to do with swans or the sea. The city's Welsh name is much more practical. The River Tawe flows through the city into the sea, and Aber means mouth of a river so the Welsh call the city Abertawe [pronounced Abba-toway]. This name does not appear in records until the 13th century, when the castle was taken by Llewellyn ap Gruffydd in his campaign to become the sole Prince of Wales. The area was part of the old Welsh kingdom of Ystrad Tywi, meaning valley of the Tywi (could be the River Tawe, which flows through Swansea, or the River Towy which flows through Carmarthen!). The kingdom was divided into areas of about one hundred villages or settlements, called cantref, which literally means cant, one hundred, and tref, village or settlement. The cantref in this area was called Eginog, and was divided into three cymwd (commotes) called Gŵyr, Carnwyllion, and Cedweli. Gŵyr comes from the old Welsh word gwhyr, meaning curved, which refers to the shape of the peninsular. When the Norman baron Henry de Neubourgh seized Gŵyr in 1138 he 'anglicised' the name as Gower and changed his name to Henry de Gower. There was another Welsh kingdom to the east of the Tawe, called gwlad Morgan (the land of Morgan). It stretched from the Tawe to the River Wye. 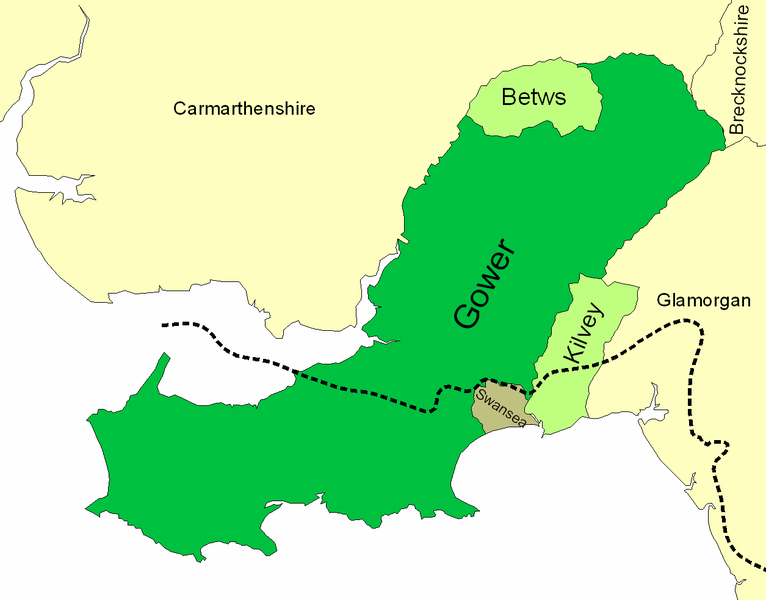 In the Acts of Union, 1536-42, Gower became part of the new county of Glamorgan. Gŵyr had always been associated with lands to the west, but the government took no notice of this. Today Swansea has its own county, but still incorporating lands to the east, rather than the west. So which do you prefer today – Swansea or Abertawe? Or should it really be called Sweynesse?